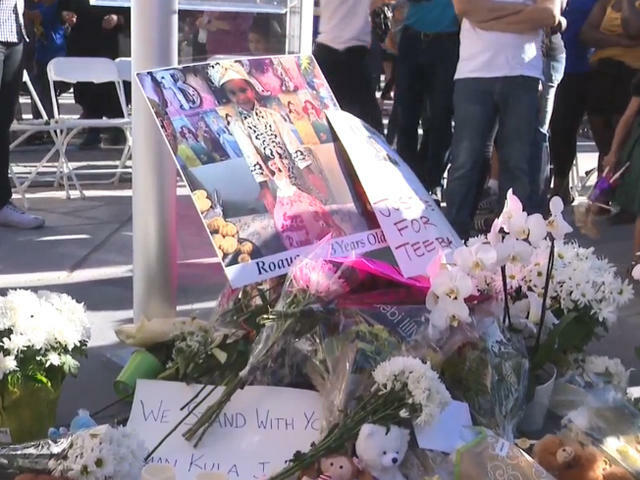 Girl slain in Boise stabbing "loved pink and Disney princesses"
BOISE, Idaho -- The three-year-old Idaho girl who died from her wounds two days after a mass stabbing at her birthday party Saturday has been identified as an Ethiopian refugee "who loved pink and Disney princesses." CBS Boise affiliate KBOI-TV reports Ruya Kadir is the victim who lost her battle to survive. The station cites The International Rescue Committee, an organization providing support for the families involved in the stabbing. IRC President and CEO David Miliband said in a statement, "Our caseworkers describe Ruya as a child who always sparkled when she walked into a room. She was her mother's princess, always the center of attention, and loved pink and Disney princesses. She had just turned three years old Saturday, and according to our IRC colleagues in Boise, was the epitome of sweetness. "Ruya and her mother are Ethiopian refugees. They arrived in the U.S. in December 2015 and settled in Boise. Her father is in Turkey. Ruya's parents are enduring every parent's worst nightmare, which is made doubly cruel by the fact that they fled to America to escape conflict in Ethiopia. IRC had resettled the Kadir family in Boise. Our local team is doing everything possible to support the family – and the other refugees injured on Saturday – in this moment of extreme distress and fear." Authorities say a man invaded the birthday celebration and attacked nine people with a knife. Word of the child's death came at Kinner's first court appearance, where Ada County Magistrate Judge Russell Comstock told him that he was charged with first-degree murder and other felonies in connection with the attack. Kinner is American, and the victims are members of refugee families from Syria, Iraq and Ethiopia. Boise Police Chief William Bones said the evidence doesn't suggest the attack was a hate crime. If convicted, Kinner could be eligible for execution under Idaho law. Correction: An earlier version of this story misstated the name of IRC President David Miliband.